Nerf Rival is a high-performance line of toy blasters from Hasbro. If you have ever played paintball and recall the sting of those pellets, then that is what you get with these powerful, toy guns that shoot compact, foam ball ammunition of up to a velocity of 105 feet-per-second and a range of more than 100 feet. This toy gun happens to be one of the more confusing Nerf products for parents, because you often associate “Nerf” with soft and safe. And to some extent, that is still true with Nerf Rival, which is sold in the toy blaster aisle right alongside traditional Nerf blasters. But make no mistake, the Rival line is Nerf for big kids only. 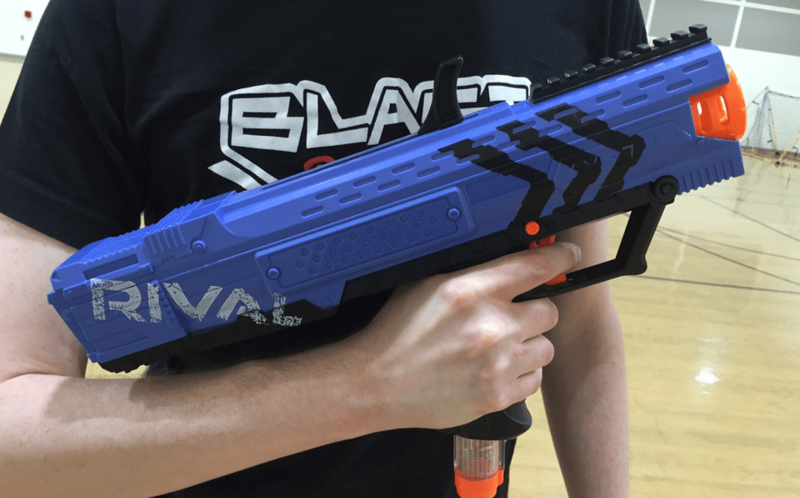 In fact, the whole premise of the Rival line is that it performs at a level closer to Airsoft or paintball than traditional Nerf products—and that is intentional. For the correct, age-appropriate audience, Hasbro’s new RIVAL series is a welcome addition to the legendary Nerf foam blaster line-up for "precision battling," as they put it. According to Hasbro, the Nerf Rival is aimed at a target audience of 14 to 20-year-olds. It was first released in the fall of 2015. The current line of blasters includes the Zeus MXV-1200, Apollo XV-700, Khaos MXV-4000, Atlas XV-1200, Artemis XVII-3000, Nemesis MXVII-10K, Kronos KVIII-500, Prometheus MXVII-10K, Hades, XVII-6K, Hera MXVII-1200, and the Helios XVIII-700. According to Hasbro, the older, 14-plus age group had been a missed opportunity. It was an age segment that would rather play video games or extreme sports than play with Nerf guns. So what did Hasbro do? They ramped up the performance to convince older kids—and perhaps a few adults—to put down the video game controller and start blasting. To be clear, Nerf Rival still uses foam ammunition, but the new, “high impact rounds” (medium-density foam balls of nearly 1” in diameter) are propelled at velocities of 85 to just over 100 feet-per-second, which is roughly 30 to 40 feet-per-second faster than regular Nerf darts. These higher velocities could spell trouble for children under the age of 14 who might be interested in RIVAL blasters. In fact, Hasbro goes so far as to sell Nerf RIVAL masks that, while not safety rated, make it clear that shots to the face have the potential for harm. Another concern is the use of Rival blasters by under-age users on younger siblings, animals, or others for whom the higher inherent velocities could be injurious. In addition to the safety concerns from the velocity of Rival's high-impact rounds, it must be noted that small children and pets may find these small, foam balls a tempting treat. Around young children, the ammunition is a choking hazard and requires special vigilance beyond even that required of traditional foam darts. One leftover RIVAL round found lying in the backyard could spell trouble. If your child is under 14 years of age, there are lots of other, great Nerf blasters out there like the Demolisher 2-in-1. And, even if you are shopping for a teenager or adult over 14, you should still be mindful of the presence of other small children or animals that may accidentally be impacted by stray RIVAL rounds. The Rival blasters are not among the easiest Nerf products to use. The Nerf Rival Apollo XV-700 has a particularly heavy cocking action, which even some adults may find a challenge (children under 14, especially, will find it hard to prime, and would likely be put off by the difficulty). In addition, the Apollo has a very thick handle, since it is built to accommodate an ammunition magazine. Smaller hands simply will not be able to hold it well. The twice-as-expensive, battery-powered Nerf RIVAL Zeus MXV-1200 has its own issues. Chief among them being a noticeable heft (due to a massive, 6 “C” cell battery requirement), and a fiddly ammo magazine loading chamber. The Zeus is also very loud—it was measured to be up to 10 decibels louder than a comparable Nerf Demolisher 2-in-1 blaster, at some frequencies. But for older teenagers—and adults, especially—all of those downsides will be easily forgotten when these high-performance beasts come out to play. The Rival Apollo and Zeus have impressive ranges of around 90 feet with an arc (about 1/3 of that when firing flat) and shot velocities close to 100 feet-per-second. The Zeus was moderately more accurate than the Apollo, and also had a much higher rate-of-fire. Both the Zeus and Apollo are notable, however, in how they surpass what is possible from traditional Nerf blasters that typically can’t shoot as far nor hit nearly as hard. If you look at the specific features of the Apollo or Zeus, you will find a blaster that does one thing or another better, but for an overall package at just $25, the Apollo is hard to beat from a performance and fun standpoint, and even at $50, the Zeus is very impressive in how quickly it can belt out hard-hitting rounds.